It is one of the constitutional goals of the Deutsche Meteorologische Gesellschaft (German Meteorological Society) to share knowledge on weather and climate with society. Teachers are important distributors of knowledge and information, and they have the ability to arouse interest and enthusiasm in exciting, relevant and challenging topics in the future generation. Unfortunately, education on meteorology and climatology plays a minor role only in the school curriculum in German Federal States. It is basically affiliated to geography, and thus neglects the high mathematical and physical science demands of modern atmospheric sciences. In 2002, DMG and the German Research Centre for Geosciences (GFZ) in Potsdam offered a two-day further-education course for teachers devoted to developments and challenges in Earth Sciences. Over the years, the autumn school “System Earth” has been held 15 times, and the event has become a fixture in DMG’s activity calendar every November. 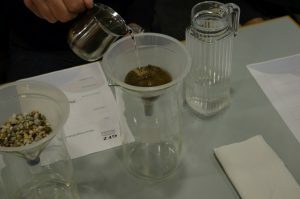 In the same way, it has become a fixed event in the personal schedule of many teachers, mainly from the Federal States of Berlin and Brandenburg, who are regular participants (and eagerly ask after the summer holidays for the date and programm). During the past few years, groups of student teachers also participated as a form of education outside of the university’s lecture rooms. The number of participants typically ranges between 70 and 100. 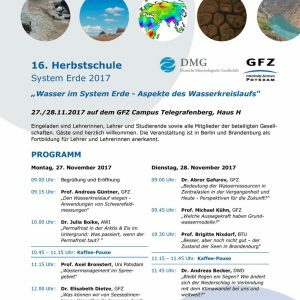 The programme for the autumn school focuses on an annually changing general topic on which 10-12 lectures are given by scientists from the GFZ and other research centres and university institutes active in the field of geo-science. This therefore provides a broad and interesting mix of presentations on geophysics, geology, meteorology, climatology, hydrology and related disciplines. Where applicable, the general topic is related to the theme of the “Year of Science” defined annually / bi-annually by the German Ministry for Education and Research. 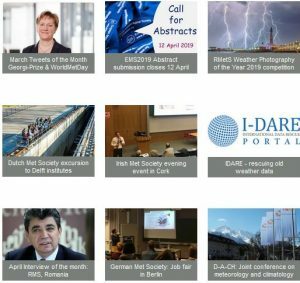 Over the past few years, the general topic covered fields including “A view into the future: Forecasts in the Geosciences”, “Future of the City – City of the Future”, “Panta Rhei: Flows and Mass Transports in the Geosciences”, “Oceans and Seas: Discovering – Exploiting – Protecting”. Weighing the water cycle: Applications of gravity measurements. Ice and water in the Arctic: What happens if the permafrost melts? Water resources in Central Asia – the fate of Lake Aral. The ecological status of the lakes in Brandenburg. Will rain remain a blessing? – Climate change and projected precipitation in East Germany. 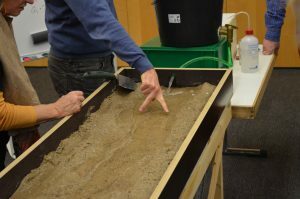 In 2017 the organisers offered, for the first time, a series of four one-hour workshops with special experiments and hands-on installations which gave the teachers the possibility to test, discuss and take home ideas and material on how to illustrate certain aspects of the general topic in their lessons: These workshops covered topics such as “How does a river function?” or “Evaporation: Understanding the invisible”. The workshops were prepared by the “GFZ School Lab” and the “Wettermuseum Lindenberg”. This new element of the autumn school achieved great interest and was much appreciated by the participants. Currently, the organizers are planning for 2018.